Film buffs will be treated to classic widescreen movies during the "Big Screen 70MM Festival", including extremely rare 70mm prints from studio vaults and archives. The festival opens Sept. 13 and runs through September 29. The festival will feature two of only seven movies ever produced for Cinerama's three-projector technology, "This is Cinerama" and "How The West Was Won". 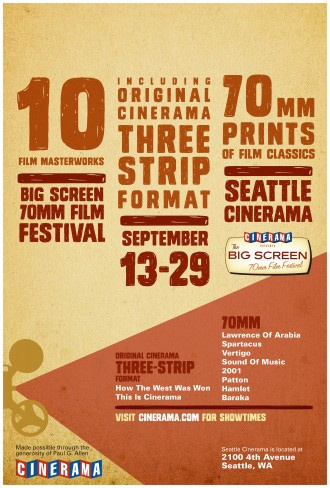 Cinerama Theatre is owned by Paul G. Allen, the Seattle philanthropist and co-founder of Microsoft. He saved the vintage 1963 movie theater from demolition in 1998. Last year he gave the theater a multi-million dollar upgrade, with digital sounds, 3-D capabilities, a new screen, movie memorabilia from his personal collection and the best selection of locally-made concessions at any theater in Seattle. We’ve outfitted the new Cinerama with world-class advancements—just as you would expect from owner Paul G. Allen—an impressive technical upgrade featuring the latest in motion picture technology. The new state of the art digital projection, sound system, and 70-foot screen provide the best visual and audio experience found on the planet. Cinerama has leaped once again into the technical future. 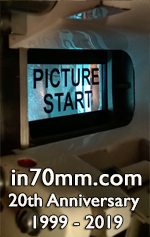 Yet it’s equally important to embrace our historic roots with Cinerama 3-strip projection, and 35/70mm capabilities. The existing film projectors have all been kept intact. There are only three theaters in the world that can still show Cinerama movies, and we have the one and only that can show Super Cinerama.